Or view larger version. Hell no, nobody goes. 1967. Frank Cieciorka, artist. Poster. Collection of Oakland Museum of California, All of Us or None Archive. Gift of the Rossman Family. This blocky figure with an upraised fist stands proud against an unjust war. Stop the Draft Week was one of the first major demonstrations against the Vietnam War, organized by a broad based coalition of peace, antiwar, civil rights, and labor groups. Cieciorka produced this poster after returning from Civil Rights organizing in Mississippi. 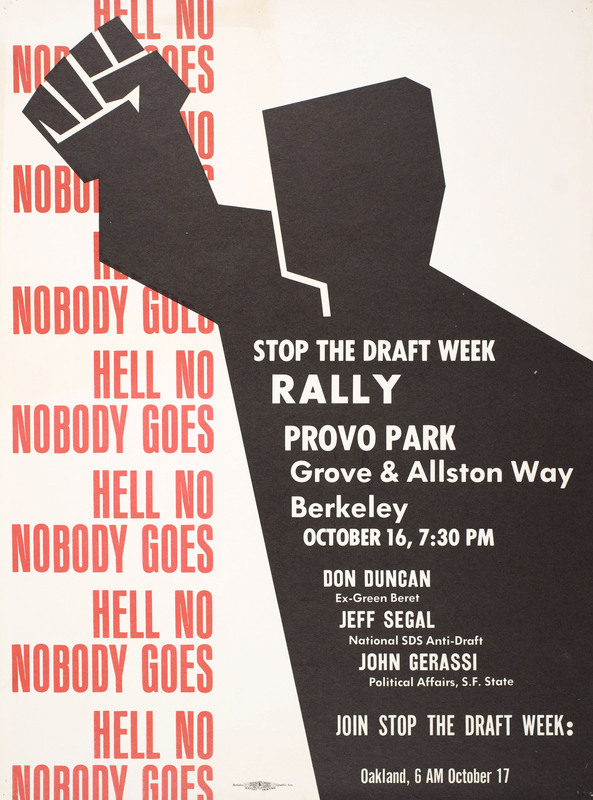 The first poster sported the slogan “Hell no, we won’t go,” changed to the more inclusive “nobody goes” in this version. The figure’s fist was so iconic it was picked up and used by political groups in the United States and around the world.